ABSOLUT VANCOUVER launched November 10th! 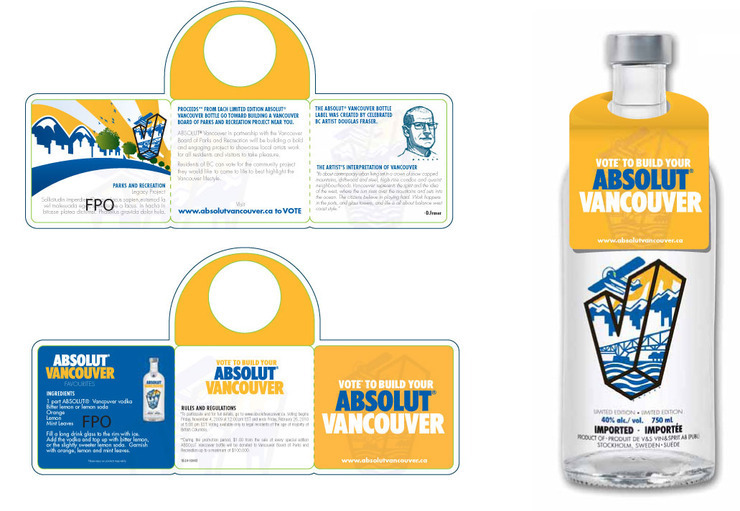 Tah-dah, a special edition limited run city themed bottle, ABSOLUT Vancouver. The graphic brand of ABSOLUT is a big one, and includes quite a body of work. 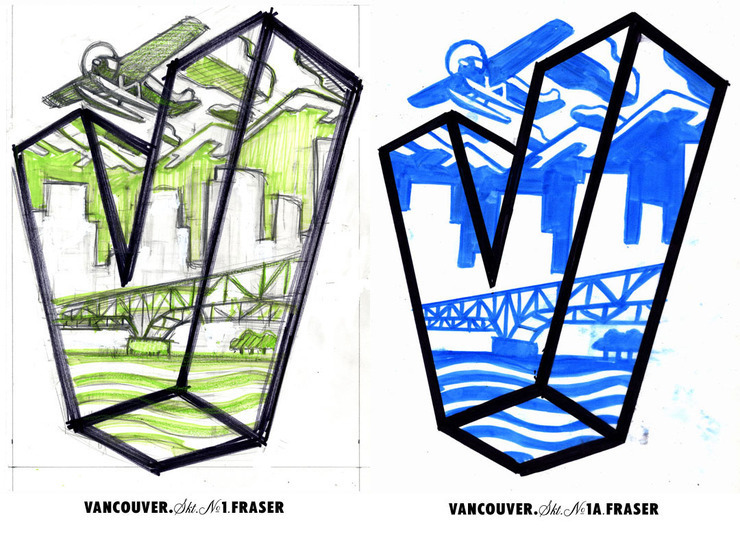 So when I received the invitation to create a city themed, and one of a few special city themed labels, this one for the city of Vancouver, I was very excited. As a west coast resident(British Columbia) it's was great to pay homage to one of the most vibrant west coast cities on the planet. Vancouver has a very contemporary skyline set against gorgeous snow capped mountains. With classic float planes coming and going, connecting the city centre to communities on the neighboring islands, and up the coast. There are bridges that link the city centre as well to the greater area of the more suburban communities. The city has a great blend of natural beauty with a strong urban character based on access to some of the most spectacular scenery around, plus being the gateway city on Canada's west. I developed a couple of approaches, but always wanted at least one of those Canadian classic de havilland beaveresque float planes in the image. 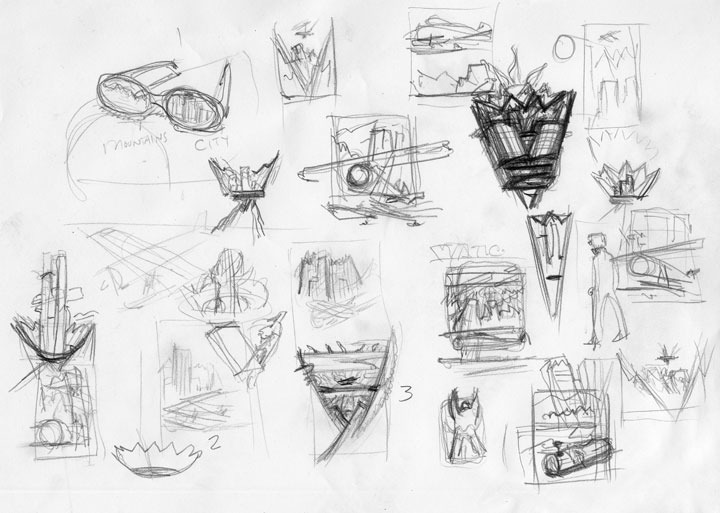 I developed thumbnails, thought about the quality of life I've experienced in Vancouver. Looking at the typography that Absolut has established. The bottle and it's clean lines with the clear glass canvas had me deciding that a clean vector would marry well with the surface, and look contemporary. 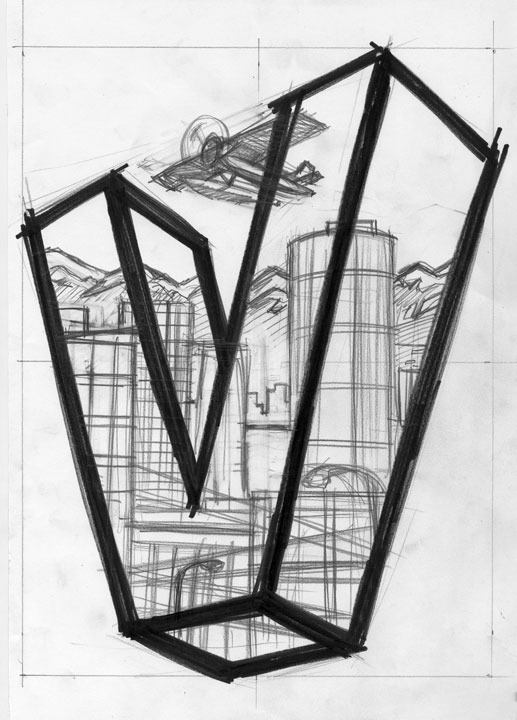 The pop-heraldic chevron shape "V" really stuck in my mind. It was on old Vancouver Canucks hockey jerseys. 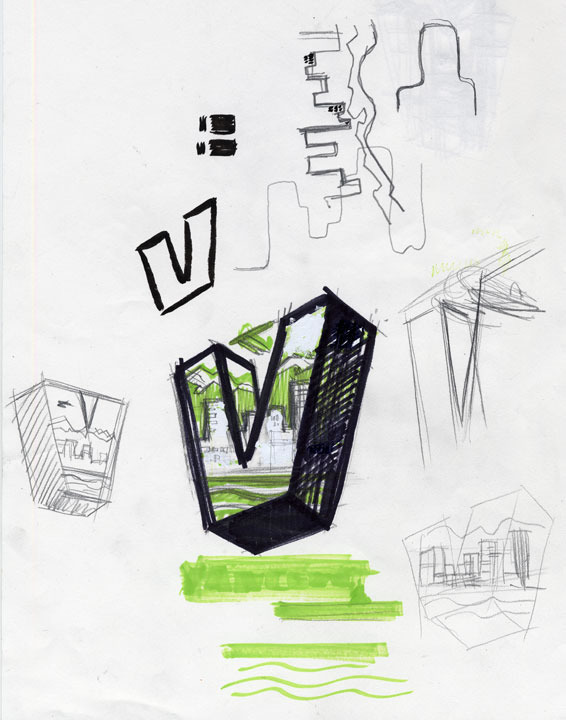 From finding a direction it was about reducing the elements to their primary shapes, and composing the positive & negative shapes inside the "V". The blue and gold tie into the Swedish heritage of the company, and the provincial colours of British Columbia. 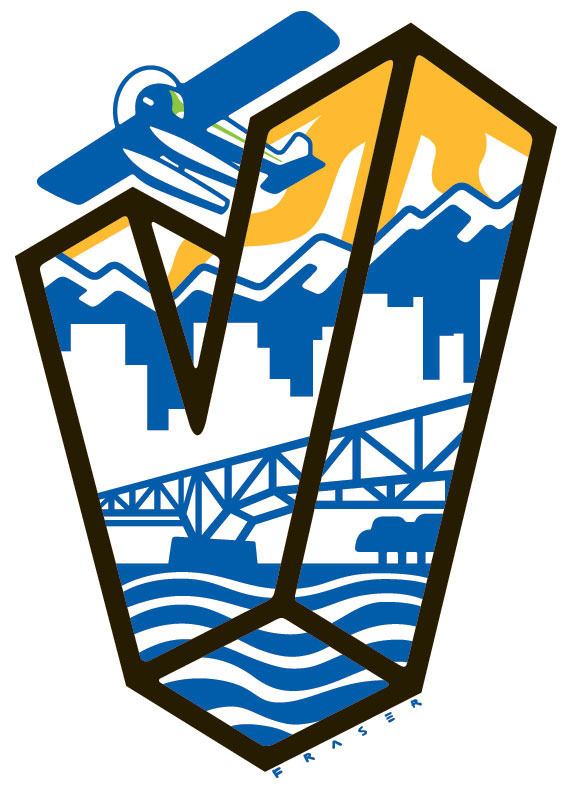 Nature, urban, sun from provincial flag, downtown linked to the surrounding communities by bridges, The trees and running trails are there under the bridge, The Classic float plane connects the urban to the mountains, the "V" shape(chevron shape like two raised up arms) , all inside the area of a bottle label. Also I wanted to see the final art screen printed onto the bottle. The more tonal blending, or loose an image was, the more it would be necessary to develop a sticker label which is not what I wanted. ABSOLUT asked me to sign my work, and it would be printed on the bottle with the label. They showed a great interest in respecting me, and my process. The people I want to thank a lot are Kelly Kretz at Corby's, Craig Bond at B Street, and Stan Olthuis at Sharpshooter. Without them it would not have happened. The bottle is a limited run, and will be done probably by the holidays. Very cool, Doug! 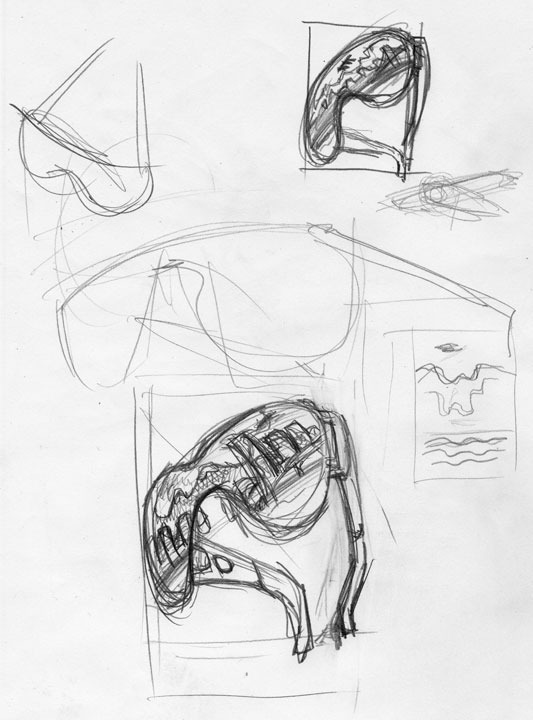 I also like the sketches; although you definitely made the best choice from them, I also like the sunglasses as just a pleasing visual. Any chance the bottles will ever be in the states? I'd love to nab one. Nice Doug. ”It's about contemporary urban living set in a crown of snow capped mountains," - that's awesome! I can't wait to see ABSOLUT: WISCONSIN, and the assorted beer cans, motorcycles and mountains of bratwurst. Nice design you put on the bottle, I like cityscapes myself...always been a fan of city skylines. It goes a long way when people appreciate the work that you do, it makes you feel good about your work thus giving you the desire to go on. I like it when things like this happen. Great gig and really tight execution. Loved seeing your process. You know you've made it when your face is hanging from a vodka bottle. Beautiful design that must look great screen printed on the bottle. Good work Doug....We love it! The self portrait is fantastic. A vintage feel really pulls it all together with your style. Good on ya! To my knowledge the bottles are only sold in British Columbia. Fly to Vancouver snag one in the duty free. Have a great time while you're doing it. Oh yeah there was a big martini party on the top floor of the Fairmont Hotel in Vancouver on Tuesday. Some great tasting martinis were had by many, Cheers! Whoa! Right man for the job! An instant Fraser classic - perfect colours, symbolic content and a flawless composition. Congrats Doug on a superb piece! Doug, Really nice final design and your name and face is on the bottle!. Skoal! This is a terrific piece of work Doug. And who doesn't want their face on a bottle of vodka?! Turned out nice. I love the float plane in sketch 3! Wow, You're a master, Doug. The transparent "V" could have been difficult to pull off, but you did it in grand style--that gold color is perfectly placed. What a cool project. Beautiful! Wish I could pick up a bottle. Dream job - perfect execution. You've got design chops! They hired the right man for this project. Bottoms up, Doug, great work. I am speechless, Doug. What a fantastic project man. Very nice job.